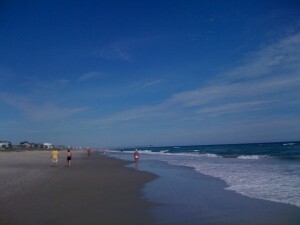 The Crystal Coast Blog» Want to Get Healthy? Walk the Beaches of the Crystal Coast! 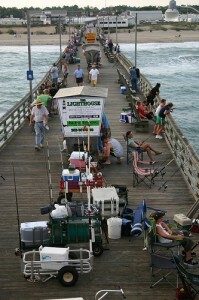 Bad joke… but yes, we have a pier on Emerald Isle (The Bogue Inlet Pier) and it’s a great place take a short stroll after your flounder meal at Jordan’s Seafood or maybe the spicy shrimp at Rucker Johns before you dive into that banana split at the DQ. For those seeking a real challenge, leave the hard surfaces behind and opt for walking in the sand. Sure, it requires greater effort than walking on a hard surface, but remember, your testing those muscles and tendons making them work harder as you motor up and down the beach. Exercise experts all agree that walking at a slower pace requires more effort than walking fast or even jogging. By instantly adding the ingredient of sand and it requires 2.1 to 2.7 times more energy over walking on hard surfaces. If you prefer to pick up the pace, jogging on the beach uses1.6 times more energy than jogging on hard surfaces. We all know how too much exposure to the sun can have a terrible impact on our skin. Be sure to heap large amounts of sunblock when taking your stroll along the beaches of the Crystal Coast especially during those mid-day walks. Be sure to take care of your feet too. A quick stroll down the beach in bare feet is fine, but if you are going for a longer distance then make sure you walk in shoes. Walking shoes are an excellent choice or better yet a good pair of sandals is an excellent choice too. That way you do not have to worry about getting your shoes wet. Podiatrist also warn against walking too far in the sand in bare feet as it can result in shin splints or a sore tendon in your heel. When is you favorite time of day to take a walk on the beach – early morning, late evening, or midday? Please feel free to leave a comment and let the rest of us know your preference.